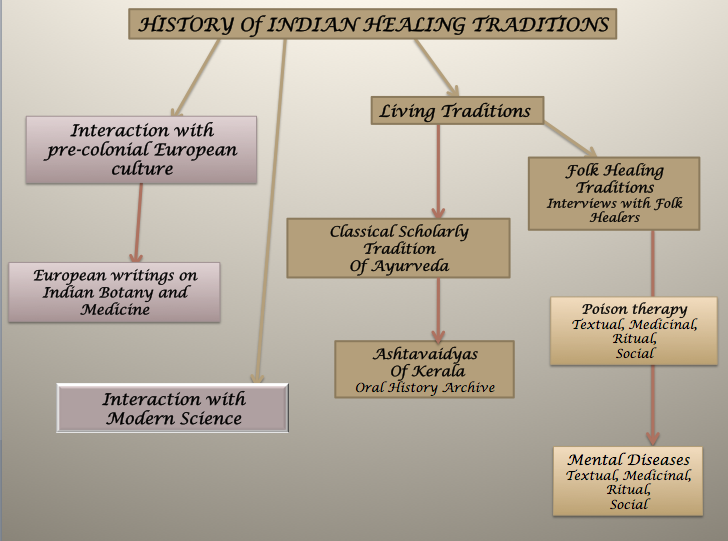 India has diverse healing traditions based on classical knowledge as well as regional folk practices. This project focuses on the rich healing traditions of South-west India known as “Malabar” to the ancient world that extends from Goa to the southern tip of India. Regional medical knowledge, classical Ayurveda and diverse medical practices brought by traders and travellers throughout recorded history have created a unique medical culture in this part of India. The natural resources found here have also been important for developing specific healing practices that even today distinguish this region. The overall scheme of our work is outlined below.